This year’s wild salmon season is coming to an end, but you can still get freshly caught Coho salmon through September. I just received some from the Copper River/Prince William Sound Marketing Association. Coho, sometimes called Silver salmon, is slightly lighter in color than Sockeye, and its flavor is milder as well. 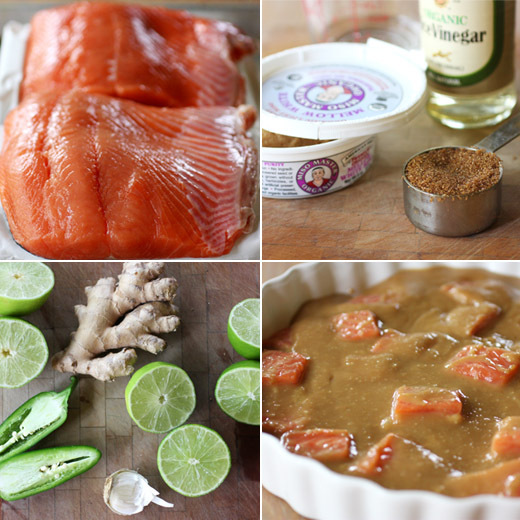 I had an idea about using the Coho for an hors d’oeuvre, and combined two different recipes. First, I remembered a crusted salmon dish from Martha Stewart's Hors d'Oeuvres Handbook . In that recipe, salmon was cut into small chunks, and each piece was pressed into a mix of spices and then seared. The flavors were Moroccan, and there was a citrus dipping sauce made with yogurt. That sounded lovely, but I also had my eye on a salmon recipe from Power Foods . That one is a recipe for a main dish, but I was interested in the miso marinade and used it for small chunks of salmon rather than full servings. It's served with a cilantro, lime, ginger, and chile sauce. 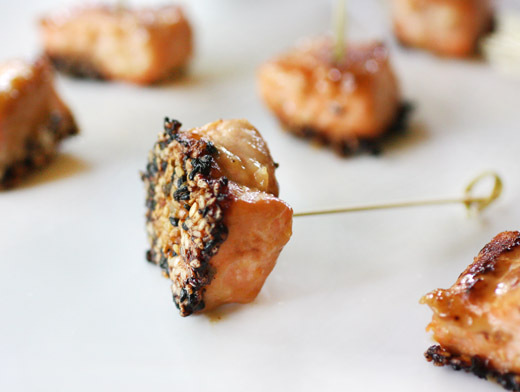 So for my version, I marinated chunks of salmon in a miso sauce and then pressed each chunk into a mix of black and white sesame seeds. The chunks were seared and then served with little picks for dipping into the cilantro sauce. They looked a lot like Martha’s spice-crusted hors d’oeuvre but had different flavors. Step one was to make the marinade. A cup of white miso, a third of a cup of rice vinegar, a quarter cup of brown sugar, and a third cup of water were cooked in a saucepan just to dissolve the miso and brown sugar. Miso should not be brought to a boil. The mixture was left to cool to room temperature, and the salmon was skinned and cut into bite-size chunks. The salmon chunks were covered with the cooled marinade and then refrigerated for an hour. Next, the cilantro sauce was by pureeing cilantro, lime juice, shallot, jalapeno, garlic, fresh ginger, and vegetable oil. After an hour, the salmon chunks were removed from the marinade, excess marinade was shaken off each piece, and the pieces were pressed into a mix of black and white sesame seeds. I seared the pieces, seed side down, in a saute pan with a little oil, and then briefly flipped each piece to brown the miso marinade lingering on the top side. I served the salmon with a cocktail pick in each piece and the cilantro sauce on the side. The cilantro sauce was a bright-tasting and lively match to the miso and sesame on the salmon. And, the miso marinade coated the salmon well to give each bite sweet-savory flavor and color from being caramelized in the pan. The little salmon chunks were hard to resist, but the marinated and seed-crusted idea would be just as good with full-sized fillets. A great idea! Those would be great for a party. These salmon bites are delightful. A perfect party food! Looks terrific! 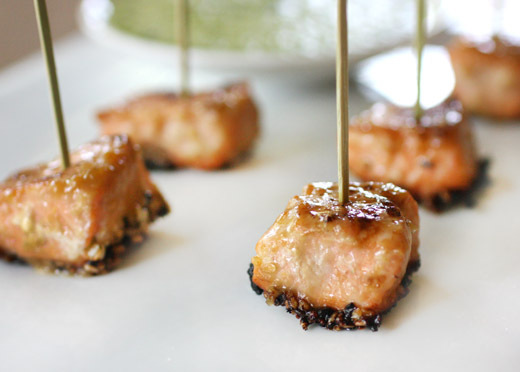 I love the idea of salmon skewers as an appetizer- way less boring than the typical cured or smoked salmon you typically see. The mix of flavors sounds intriguing as well- I wouldn't have thought to pair miso with cilantro. What an inspired appetizer! Marvelous flavors to compliment the salmon, all in perfect little nibbles. Seductive and succulent, they will quickly disappear! Those are perfect little mouthfuls, Lisa. The marinade sounds simple, but flavorful. Love the dipping sauce. Ah to have a fresh salmon season anywhere in sight. You lucky girl!!! I love how you've made this recipe your own, Lisa. Not only does it sound exciting, those little gems of Salmon goodness look ever so enticing!!! P.S. I am so pinning this!!! So nice! Love salmon, and it's great as an appetizer (or as anything except for dessert - and if I ever have a salmon dessert, I'll probably like that too!). Pretty dish - thanks. Marvelous party appetizers, Lisa! The Asian style flavors are so fitting to a well-crusted salmon. Delish! I can’t believe you can make the healthy version of Sesame-Crusted Miso Salmon with Cilantro Sauce! I need to try cooking with miso. These bites are great for a party. These little salmon bites look delicious. I love the marinade you made for the salmon. What a wonderful way to serve salmon! I'd love to serve these to my book group. Great idea! such an elegant appetizer! love it! This is such a great idea! I love the contrasts of strong flavors and texture with the seeds. Truly divine party food Lisa. Very sophisticated. Bet it tastes amazing. I keep saying it but I just don't make fish often enough but this might just get me cooking! I love the flavors, love them! And they look more than good. Perfect! I'd eat every one of these salmon bites! What a great idea to serve when entertaining Lisa! Love the sauce AND the cilantro topping! I'm printing this off!